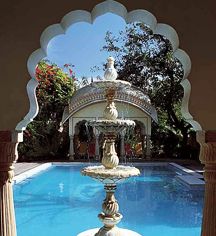 With its lush romantic courtyards, serene alcoves, and colorful gardens, Alsisar Haveli represents the grandeur of traditional Rajput architecture. The hotel offers 45 spacious guestrooms, brilliant meeting and entertaining spaces, and traditional splendor without sacrificing modern conveniences. Alsisar Haveli was awarded Best Historic Hotels Worldwide hotel in Asia/Pacific for the 2017 Historic Hotels Awards of Excellence. 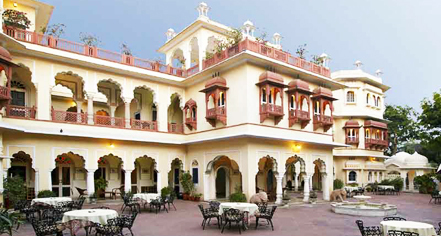 Alsisar Haveli, a member of Historic Hotels Worldwide since 2012, dates back to 1892. Alsisar Haveli was originally a vacation home in Jaipur for the Alsisar family when they visited the Jaipur royal family from their principality, Alisar, to attend events and make appearances. Check-in time: 4:00 p.m.- 4:00 a.m.
Payment: All forms of payment are accepted. Payment is required at time of booking. Visa, MasterCard, and Amex, are accepted. Learn more about the History of Alsisar Haveli .